Lyon's (No Dessert Forever!) rhymes constitute a fairly standard catalogue of big rigs, with little snappiness to invite a return run. ""Trucks have trailers./ Trucks have cabs./ Some haul rabbits./ Some haul labs."" (The last reference is to the dog breed, not research facilities.) But Frazier's (the Stanley series) digitally colored pictures may offer enough visual compensation to hold readers' attention. The illustrator's high-contrast palette and strong, geometric shapes give the pages plenty of retro pop, while also creating a fun sense of texture and dimensionality reminiscent of cut paper. (The nighttime scenes, vividly illuminated by gas station fluorescent lights or the trucks' high beams, are particularly striking.) The trucks are given whimsical cargo to transport, including larger-than-life chocolate chip cookies, toys and fruit. Heroic angles play up the vehicles' star power, and a large-scale, two-page spread devoted to a truck cab interior brings readers up high with the driver. 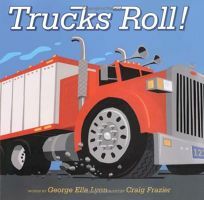 Still, the shelf of truck books is already heavy and, despite novel touches throughout, the captivating artwork alone may not be enough to draw an audience beyond the truly truck-obsessed. Ages 4-7.